The ubiquitous European melodic heavy/power metal: that's my first best observation of Seven Thorn's Return to the Past. Even the title of this work betrays the essential character of the music within. Less Helloween and more early Edguy or mainstream Freedom Call. Strong arrangement with the vital ingredients are here: strong vocals, lots of melody with great hooks, sizzling fret work, and pummeling ambitious rhythm section. 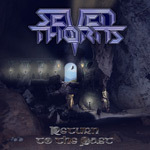 Seven Thorn's Return to the Past is what it is, with little compromise to the genre. However, vocalist Erik "Ez" Blomkvist, late of Platitude and Dreamscape, while effective, seems to be slumming here. Certainly, he's good throughout, after all he's quite the professional. But Return to the Past is rather average territory: there's no real challenge for him here. Yet, this collection is helped along by the strong contributions of visitors Mikkel Henderson (Fate, Evil Masquerade) on keyboards and guitarist Olaf Lenk (At Vance), solo on Liberty. Strong accolades to Spread Your Wings, Liberty, and Through the Mirror. Otherwise, this is average stuff. Fundamentally, on Return to the Past Seven Thorns solidifies their musical direction: simple melodic power metal in the European vein. If you're a fan of the genre, Return to the Past is derivative, proficient, and entertaining. Essential or noteworthy? I wonder. If you're a fan of the genre, Seven Thorns' Return to the Past is derivative, proficient, and entertaining. Essential or noteworthy? I wonder.